In today’s world people have different reasons for wanting a hot tub. Some look forward to physical health benefits, others are more interested in improving quality family time, and then there are those just seeking relaxation and escape from life stressors. So how can these basic benefits serve distinct people with different lifestyles, different needs, and different expectations? 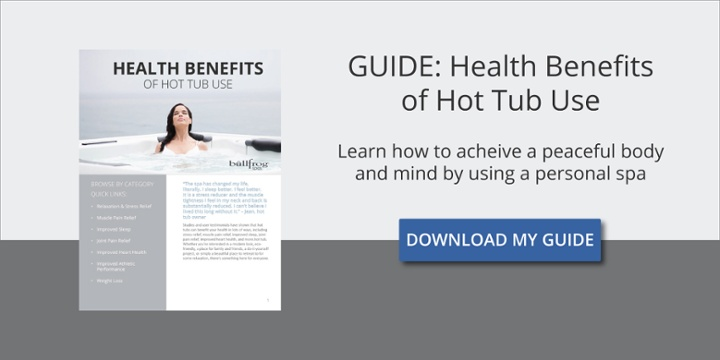 Regardless of your age or lifestyle, a hot tub benefits your life in many ways. For athletes, soaking in a hot tub after a workout can support fitness goals by helping to reduce swelling and loosen stiff joints. Older couples may find the effects of hydrotherapy comforting to relieve pain associated with arthritis and improve flexibility. And this is only the beginning. Just remember to keep in mind the safety guidelines for using hot tubs, particularly while pregnant or with any pre-existing conditions. Check out what other hot tub owners are saying about how spending time in a hot tub serves as a solution to individual life issues and ultimately boosts their overall well being. Relaxing your muscles and joints is an integral part of an active and healthy lifestyle; skipping this step opens the door to injuries that can prevent you from engaging in any activity at all. Whether you run marathons, practice yoga, weight lift, ski, or swim laps, hydrotherapy will relieve your discomfort after a hard workout. Studies published in peer-reviewed medical science journals have consistently identified that hot water immersion and hydromassage improve health outcomes, especially when it comes to sore muscle relief. Experts state that one of the best ways people can find sore muscle relief is through hot and cold therapy. This practice uses both warm and cold applications to an injured or strained muscle group to help alleviate and soothe muscle pain and tension without medication. According to Gatorade Sports Science Institute, recent research has even shown “that hydrotherapy, compression, and massage can enhance acute performance when utilised appropriately.” The article goes on to talk about how hydrotherapy, post-exercise, helps aid in muscle recovery due to the positive effects of water immersion, i.e., increased circulation and reduced inflammation. They don’t call it the Golden Years for nothing. So why do only three in ten adults age 75 and older consider their lives today to be better than they were 10 years ago? If you’re looking to feel young again, hot tubs are an excellent place to start. It can also relieve the symptoms of a variety of other ailments including high blood pressure, diabetes, Parkinson’s disease, fibromyalgia, gastrointestinal distress, and a lowered immunity. By soaking in warm water, the heat helps reduce the force of gravity which can place additional stress on joints, decrease swelling, and increase blood circulation. A spa’s rehabilitation and physical therapy uses for older adults are endless. While doing strength and cardio exercises in the aquatic environment, mobility and muscle mass increase while providing less chance for injury. For those who suffer from joint and muscle pain, there are some easy, yet effective, aquatic exercises you can start doing in the comfort of your own backyard. An added bonus? Your grandkids will love coming over to grandma and grandpa’s house! In today’s world of technology, school, work, and activities, finding quality time together as a family can be more than a little hard. One UK study found that families are on average spending little over half an hour quality time together during the week. And even when families do get together, seven in ten parents say that time is spent in silence watching TV, on a mobile device, or simply too tired to talk. Studies have shown that families who spend time together have children who are happier, healthier, and perform better in school. Quality family time also fosters positive emotional health in children, which in turn correlates to less likelihood of risky behavior (and poor choices) such as drug and alcohol use. For families who are are looking for ways to unplug and reconnect with each other, a hot tub is a wonderful option everyone is sure to approve of. For kids, there is nothing more fun than playing around in the water. And for teenagers, hot tubs take away the distraction of social media and technology. Make it a family night with games, laughter, and great conversation. Or just relish in some couples time without the kids. Need some family-friendly game ideas? Check some of these out addicting hot tub games everyone is sure to enjoy. If you’re worried about the maintenance and expense of a spa, don’t be. Hot tub maintenance is simple when you keep up on it and leading spa brands aim for optimal energy efficiency to compete. The key is to look for quality hot tub design and materials that create less friction and prevent excess heat from escaping. You’ve come home after a long day at the office and all you can think about is putting up your feet and unwinding from the craziness of the day. Perhaps, you’re planning on taking some quality alone time after the work day by soaking in your hot tub. After all, you know balancing your professional aspirations with your fitness goals (along with a healthy dose of fun) is key to being your best self. When you can’t afford to be off your game, managing your stress is key to increasing productivity. Lounging in your very own heated spa is one of the most efficient ways to relax. After a whirlwind of a day, taking the time to decompress and reconnect with yourself, your significant other, or good friends is important to your overall wellness. Over time, elevated and rapidly shifting levels of blood pressure caused by stress can lead to damaged arteries, plaque formation, and suppressed immunity. In an article by psychologist Elisha Goldstein, Ph.D., she states how “Self-inflicted attention deficit disorder, exhaustion, lack of focus, reduced health, and burnout” result from being hounded by external pressures and information overload. One other thing you can do to avoid burnout and relax is through the simple practice of meditation. There are various meditation techniques out there you can explore, but why not learn how to meditate in the comfort of your hot tub? Again, the added expense of running and maintaining a hot tub may be a concern. However, at the end of the day, your costs of owning and operating a hot tub come in less than what you may be paying each month for the chiropractor, masseuse, or club membership. “The spa has changed my life literally. I sleep better. I feel better. It is a stress reducer and the muscle tightness I feel in my neck and back is substantially reduced. I can’t believe I lived this long without it. Owning a hot tub is a big decision and one you want to make sure fits your lifestyle and supports your goals. Whether you’re looking to reconnect with your spouse and children, relax after a long day in the office, or want a place where you find relief from joint and muscle pain, we have a perfect hot tub for you—no matter who you are or the lifestyle you live.